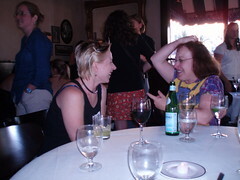 Here is Susan Mernit and I getting caught up after a year break. What crazy stories we had to tell. And blogher is just about to begin. Whew. This is an example of uploading an image from Flickr. 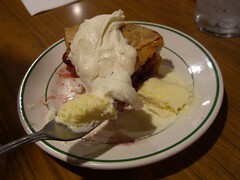 Yum, pie from pie n burger in Pasadena. Here is some text I added from Typepad. Hello out there. It's the night before Blogher starts and I'm busy putting the final touches on my topics for discussion for tomorrow. First on the agenda is a blog tour. I want to show you some site in my blogosphere and let's talk about what technology was used to create them and how that affects the look of the site. The Candy Blog - YUM! and of course, our beloved Blogher site utilizing Drupal. Yikes, it's just hit me, Blogher is next weekend. Well, next Friday and Sat actually. Where did this week go? Where did July go? Jeeze, where did this year go? I'm feeling a bit restless this moment. It's because I have finally somewhat gotten on top of my slew of projects. The BIG ONE, the ongoing one, a couple for friends, the writings and some travel. I sold the saab and feel like I'm entering a new .... level - plateau - cycle - system of my life. The words Baseline Arrival keep turning in my head. But I don't feel like I've reached a baseline. But at the same time I feel like I've reached a baseline - again and de novo. It's a strange feeling. A sort of deja vu. I've been by this road before, but it's a different road this time. If the universe is constantly expanding and we are part of the universe, then doesn't it seem likely that we choose in which way to expand the universe? If we want to explore one or another part of the unknown universe, it's up to us, to move in that direction and make the unknown known. I told my mom about Craigslist a few months ago. She wanted to sell some stuff and I suggested she check it out. She didn't have a digital camera, so I ordered her one from Amazon. This was just the beginning. In the past month, I've heard of the many stories mom has had selling her stuff on Craigslist. From the Nigerian scam artist (that we craigslisters know so well) asking her to quote her shipping her couch sectional set to Nigeria to two firemen who exchanged yard work for her bookcase set. Mom is getting the full Craigslist experience, I only fear the day she stumbles into the casual encounters room (which I only once dared to enter). I've known about CL from almost the beginning. My first job after college was in SOMA in San Francisco at a 3D VRML company. I was the bottom of the totem pole, but I worked with some interesting people. One of them turned me onto Craigslist - Linda Branagan. I got on the list when there were 4 categories and still SF focused. I experienced the evolution - the explosion into multiple lists, going to the web, more categories, more cities, fees for job postings and beyond. I'm like a lot of people; I've gotten jobs, bought and sold cars, motorcycles, found sublets and more on it. My move to LA could not have happened as smoothly as it did without craigslist. But now, it's changing my life yet again. All my childhood possessions are for sale on the Kansas City Craigslist. My mom is closing up house and moving to the West Coast. The bedroom set they bought for me in the 1970's is for sale. Along with a lot more stuff mom doesn't want to move. It's an interesting feeling, my mom using craigslist. Technology has come so far in 10 years and is getting integrated into humanity. Perhaps even some day evolving us. But for now, you can buy the bed nine year old Heather slept in, on Craigslist, an email list a 22 year old Heather used 10 years ago. I want to buy an extremely expensive piece of jewelry. A piece that costs as much as a nice mid-size car. I've had this goal for several years. I don't expect to do it anytime soon, but I like to think about it time to time. I envision going to a jeweler and picking out stones for a custom creation. I imagine getting it in a red velvet box. I envision wearing it as an everyday piece or perhaps offroading in my custom $25,000 necklace. But I don't want to wait. I want to experience this now. So I decided to surprise myself. Exploring Boston I ran into my favorite jewelery store. I had forgotten about it. (I hadn't been to Boston in 6+ years.) I found some pieces I really loved. But I couldn't come up with a good reason to get them. So I left them in their glass cases. I couldn't stop thinking about them and how much I liked them. The next day, we found ourselves near the store again. It was pouring rain as we ran across the brick. I again stared at the rubber and steel creations, wondering how I could convince myself to buy them. I racked my brain and then an idea popped into it. A job well done, deserves a celebration. I would have something to celebrate in a couple weeks. I picked out a necklace, a bracelet and a ring. I had them wrapped in gold boxes. And when I returned to Los Angeles last night, I put them in the back of my closet. They'll stay there until the time comes to open them. And when that happens, I'll remove them from their gold boxes, I'll put them on my body and enjoy them; celebrating my job well done. My $25,000 jewels can wait. I should be used to magical things happening to me, but I'm still surprised when I experience it. I spent 3 days straight with a new business colleague. We've been working together on a new project and I've extremely impressed with so much. She's smart, fun and we get along "like a house on fire". I haven't had this fun with tech work since 1999! We're half-way through day 3. We've finished our meetings and are doing some last minute shopping before catching a cab to Logan airport and then the West Coast. For some reason all the on-ramps and tunnels are closed (not the one that collapsed) and our taxi driver is getting more and more frustrated. We're driving all around Boston. We swing by the conference center, back through downtown and then I see Boston Commons and the airport is the opposite direction. We've been in the cab for 40 minutes and our flight leaves in 50. I keep calm. I know the technique our driver is using: leaving the herd to make a wide sweeping turn. But to do that you have to break really far away. Find the crack, the clear cow path and accelerate out of problems. Make the beaten path. I sit back and close my eyes. I meditate on a clear path and feel my body pressed against the seat because we're accelerating - out - of - problems! I continue to meditate until airplane exhaust fills my nostrils. It's been about 15 minutes and we've arrived to an empty airport. We zip through security and have a short wait at the gate before embarking. My colleague and I have booked window and aisle seats in hope that our middle passenger doesn't appear. We're busy chatting away as the plane loads and our B seat arrives. She's this quiet, cute 14 year old that looks like Scarlett Johansson. A question popped out of my mouth and the three of us spend the next 6 hours talking, laughing and watching TV together. It was the kind of airplane ride that changes your life - all three of them. Someday that ride will go down in history - but for now - it's a secret. For a time. I do not know enough about him. Nikola Tesla. I took a break after noon today to take a walk in the city - Boston. I walked out the door, cross the street and see a bunch of people flocking around a black guy with a Maori like face tattoo. They are pointing camera phones and snapping pictures and I think it must be because of the tattoo. As I pass by I get a good look - I'm intrigued by the face tattoo - and I recognize Mike Tyson. Just here, walking on the streets of Boston by the old courthouse. So I wander down to Quincy market and look at all the yummy foods, but don't feel like eating anything. So I'm wandering around and I keep hearing these big crashing noises and I'm thinking, wow - there's a lot of construction going on. But then I realize it's not construction at all - it's Thunder! I make it back to the office with tiny sprinkles on my head, only to get up to the 31st floor in time for the show to begin. The theatre gets dark with clouds covering the entire palette of downtown Boston, then the light show begins and the cymbals crash. It's gorgeous, beautiful, I'm electrified and energized even as I finish up my meetings. I'm totally digging on Boston today. I'm even imagining living here in one of the small 4 story brick buildings. Surrounded by the history and the freedom the United States represents. I've been a writer for years. I've been writing daily for several years with some short breaks. But recently these breaks have gotten bigger, longer and more difficult. I haven't admitted that I've had writer's block - because I think writer's block is stupid and easily dealt with - but I've been having my first case of writer's block. It's truly sucked. I haven't been motivated to write - even small amounts or tidbits. The tiny drips and drops of words I've written have utterly sucked in my mind. To the point that I'm disgusted with my ability. What happened to the word flow? What happened to my connection? what happened to my ability to twist experiences into words into images? Argh! A flowing river of cement. Well, I'm done with that. I'm coming out of the blockage and making my fingers flow. At least, I hope so. So I've been making these cross-country trips from LA to Boston quite a bit this month. It's been hard on the schedule, slightly disrupting but exciting none-the-less. This morning I spent another 5 hours in a metal tube. This trip I entertained myself with bad hair rock videos (Poison, Cinderella, White Stripes, and other the like I don't even know the name of) and reality TV shows. I think this is the most TV I've watched all year. Even though this stuff is complete and utter crap in my book - I still got a lot out of it. It was a walk down history (although not mine) and a view into current television. And it was inspiring. I took notes the entire time. The past month, I've been gestating something. Yesterday, I pulled it sticky and sweet from the ether. One moment it was a concept in the unknown, the next it was dripping in my hand - a physical manifestation. A perfect evolution. I was in love with it from first conception. Since then, I've been using every single trick in my book from riding the birth high. There's just so much more to do. The birth is the beginning. Yes, it will be a challenge to keep it safe and grow, but we've gotten this far already. First impossible hurdle, hurdled. So Lars, you asked, what's on the stage. I am, and in my hands I have something fragile, that I can't yet show off. And for some reason, I really want to keep this a secret. Maybe it's because I'm sleep deprived as all new parents are.